He means the path of totality: a 60- to 70-mile-wide ribbon of territory from Oregon through South Carolina where the moon will completely cover the sun in a total solar eclipse. Eclipse-chasing astronomers, amateur and professional alike, have been scoping out viewing spots on the path for years. But much of the public is just finding out about it, sparking a steady increase in Google searches on solar eclipses. No one knows exactly how many people will decide to hop in the car at the last minute and speed down the interstate to the path of totality. But for much of the country, a prime observing spot is no more than a day’s drive away. That’s creating huge logistical challenges for towns along that several-thousand-mile route. Hundreds of small municipalities will be in the crosshairs of what could be an enormous one-day population boom, creating significant challenges for traffic management, sanitation and emergency services. 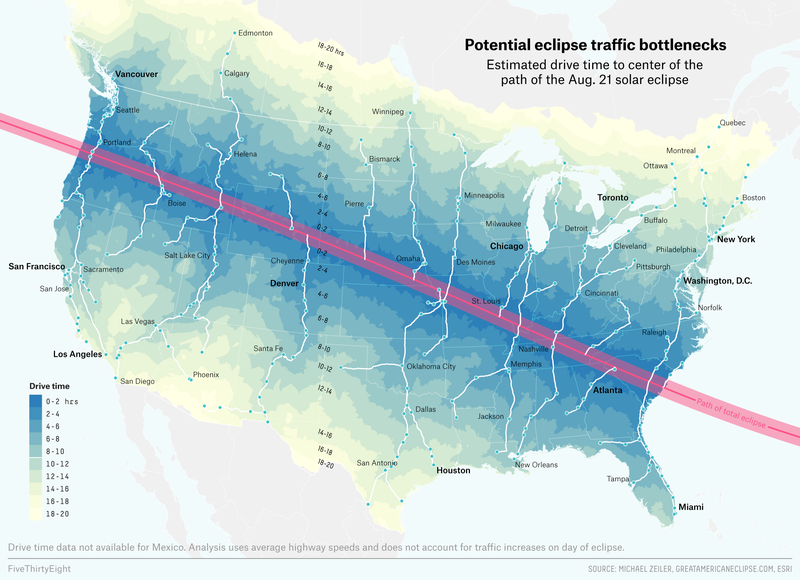 According to Michael Zeiler, a geographic information systems expert who operates the website GreatAmericanEclipse.com, about 75 million people live within a 200-mile drive of the path of totality (about 12 million live on the path). Even if only a fraction of the outsiders decide to see the eclipse, their travel could have outsized effects. “Only 4 percent of the population of the U.S. has to travel to the path of totality to double the population there,” said Angela Speck, a professor of astronomy at the University of Missouri. That kind of population spike would probably barely be noticeable if eclipse seekers were to spread evenly across the path. But where you are on the path matters — the closer you get to the central strip of that ribbon of land, the longer the sky show will be. It’s the difference between a few seconds of darkness at the edge of the path and a full two minutes at its center. Because visitors get the longest show on the path’s centerline, they’re likely to converge on the towns there. Zeiler’s estimates for path-of-totality visitors on eclipse day range between 1.9 million and 7.4 million people. So, many communities near the center of the path are planning for huge crowds, leaning on ad hoc networks that can include town officials, volunteers, emergency response agencies, astronomers, local law enforcement and state tourism divisions, among others. That once-in-a-lifetime event could mean traffic jams at choke points where major roads converge on the path of totality. But Zeiler has analyzed the relationship between U.S. population centers and the country’s road network to predict these points, and you can see the likely problem spots in the map above. “People can plan around them, travel early or avoid places where they know the traffic could be bad,” Zeiler said. Traffic snarls are also expected after the eclipse, as drivers return home through those same choke points. Transportation engineer Patrick Son recommends that eclipse viewers wait at their viewing site to give traffic a chance to dissipate before driving back. Getting people to arrive early and leave late may help prevent traffic congestion, but it means that visitors will be hanging around town far longer than the time it takes for the moon to move across the sun on Aug. 21. They’ll get hungry and thirsty, and small towns sometimes have limited options for buying food and drinks. Town planners across the path are recruiting food vendors to help feed the crowds at viewing sites. Still, some officials worry that demand for meals will be overwhelming and are asking visitors to bring food and water instead of relying on local infrastructure. “We hope people will bring supplies with them, because they might be kind of hard to get in town, and our nearest grocery is a 50-mile round trip,” Hagen said. But there’s one necessity that most visitors can’t stash in their vehicle. “The biggest shortage on the day of the eclipse will probably be port-a-potties,” Zeiler said. No one likes an overflowing toilet. But figuring out how many port-a-potties to rent for a once-in-a-lifetime event is challenging. Patti Carter is chair of the solar eclipse task force for Chester, Illinois, a town of 8,500 that’s about 50 miles south of St. Louis. She said her town started with an estimate of 10,000 visitors but after meetings with the county emergency management agency is now planning for 25,000 people to show up at its viewing areas. More people will obviously need more toilets, and the number required rises still further the longer visitors stay at an event site. Local infrastructure can make a difference: Towns like Chester that put their eclipse viewing areas in municipal parks which already contain public flush toilets can supplement their facilities with far fewer portable toilets than tiny towns with fewer amenities like Glendo, which has rented a couple of hundred portable toilets and made plans to pump them regularly over the weekend leading up to the eclipse. Fortunately, there are formulas to help them plan their orders, such as the estimates in this table. In each case, organizers hope that planning for larger crowds will improve their odds of success. “If we prepare for 20,000 but only get five [thousand], then we’re ahead of the game, and we can really make those people happy,” Carter said. But with big crowds, there’s always the possibility of unexpected emergencies, which could strain emergency response teams in small towns. Glendo and Chester are doing their best to prepare for whatever could go wrong. Hagen and Carter said portable cell towers were being brought in to dedicate to emergency coordination in case the influx of visitors overwhelms normal cellphone service. Some hospitals are planning to set up mobile units and recruiting extra staff for the weekend. And residents of some areas have been cautioned to stock up on food, water and gas. Areas that are at risk of summer wildfires are imposing burn bans. Some communities are shifting their school schedules to keep school buses off the roads that day. There’s also one very specific safety concern: eye protection. It’s only safe to look directly at an eclipse during the two-odd minutes of totality, when the moon completely covers the sun. At all other points of the eclipse, part of the sun is exposed, and looking directly at it can damage the eyes. But viewers can still watch the moon move across the sun indirectly by projecting its image through a pinhole onto a wall, the ground or a sheet of paper, or they can look directly through solar filters that meet the standards set by the International Organization for Standardization for blocking sunlight. We’ll know if all the planning pays off in a few more weeks. More visitors than anyone ever expected could show up at communities across the path. Bad weather may make crowds evaporate. Towns are trying to plan for unknowable numbers of people — and to pull it off without a dress rehearsal. It’s stressful. “I’m going to be in the fetal position in one of our park complexes by the time this is over,” Carter said with a laugh. Travel early. Allow plenty of time to get to your destination — if at all possible, arrive the day before the eclipse and plan to spend an extra day there before going home. Keep your travel plans flexible. Plan several routes to your destination in case of traffic. Don’t rely on online map applications: Cellphone systems may get overwhelmed, or you may be traveling in areas that aren’t well mapped. Be self-sufficient. Bring plenty of food and water with you, and keep your gas tank topped off. Local suppliers may experience shortages. If you don’t have a room reserved in the area, bring sleeping bags. Carry your trash away from your viewing area. Wear sunscreen, and stay hydrated. Average August temperatures along the path of totality are usually in the upper 80s. If you can’t make it to the path this year, you’ll have another chance in April 2024. That’s when the next total solar eclipse over the United States will happen.